That’s the rallying cry of the chorus to La Marseillaise, but these days in Australia it’s not quite as simple as that. Of course, you can join the Australian armed forces, if they accept you. There doesn’t even seem to be much of a problem if you serve in the armed forces of some other nation state of which you are also a citizen (most commonly for Australians, I expect, Israel, though there are probably also dual nationals serving in the British armed forces) or even one where you are not (such as, say, the French Foreign Legion). What becomes more problematic is if you get involved in something more irregular, such as not fighting for a government, or fighting against a government. Australia enacted its own legislation against getting involved in that sort of thing back in 1978. The legislation included a prohibition on recruiting for foreign government armed forces in Australia. That Act has now been repealed and its provisions, augmented as part of the “Foreign Fighters” suite of legislation, folded into part 5.5 of the Commonwealth Criminal Code . Currently it’s all about those Australians who have rushed off to Syria and Iraq to fight for (and in at least two cases, against) “ISIS”/ISIL. This is prescribed as a “terrorist organisation” by the Australian Government, which makes it an offence to fight for it or to support it. In addition, there are offences for even travelling to the area where the fighting is going on unless you can prove (the onus is on you) that your sole reason was some valid, non-fighting reason set out in the legislation. Returned fighters can also be subjected to control orders. David Hicks was subjected to these on his return to Australia following his release from prison. Orwellianly, the headline to the announcement was “New measures to strengthen Australian citizenship” – because apparently citizenship is strengthened by making it easier to take away by administrative fiat. Dutton later made clear that any judicial review proposed would go to the process, not the merits, of any deprivation. More bizarrely, it bore the legend: “E&OE.” For those not in the know, this stands for “Errors and omissions excepted” and is commonly encountered as a kind of arse-covering catch-all on solicitor’s bills, surveyors’ reports, and the like. When did this sort of thing creep into ministerial announcements? (1) is at least literally true. There was no such thing as Australian citizenship until 1949. Citizenship in Australia is a creature of statute. Historically and I think at international law it is probably still more accurate to speak of nationality rather than citizenship. At federation, Australians were either aliens or British subjects. Other than naturalisation, this was a matter of common law until in the UK it was codified by legislation in 1915 (I suspect motivated by issues arising from WWI) which was largely adopted or mirrored by the Australian Nationality Act 1920. Both the previous UK and Australian legislation provided for revocation of a grant of naturalization where somebody had aided the enemy in time of war (and for other reasons such as conviction of a crime or fraud in obtaining the grant). Secondly, where does this idea of “deserving” to be an Australian citizen come into things? Thirdly, things are really getting murky when we start saying that a terrorist necessarily betrays Australia. What exactly is a terrorist? Who decides? Different countries make different decisions; one man’s [sic] terrorist is another man’s freedom fighter, after all, and not all terrorists are engaged in terror against Australia. Fourthly, if betraying our country is the issue, aren’t such people traitors? The normal recourse of a nation state against traitors is to catch them and punish them, judicially, even if that involves the occasional over-reach, as most people now agree occurred in the case of William Joyce (aka Lord Haw-Haw). (3) is the most insidious. Is citizenship really a privilege? Surely not in the sense that it is some kind of optional extra benefit that can be withdrawn. It is a status which in turn is a springboard to all sorts of rights – most importantly not to be turned away if returning here and to be allowed to stay here. It is true that governments have always maintained that being given a passport is almost an optional extra (for example, back in the 70s, Ananda Marga members were refused passports) but that is an assertion which can only survive politically by being sparingly asserted even if the cancellation of passports has become more commonplace in recent years. Back in the cold-war years we used to hear of Eastern-bloc countries depriving dissidents (and, actually I now discover, Jewish emigrants) of their citizenship and refusing them passports and thought: how could a state treat its people so oppressively, so scandalously a.t odds with its high [ha!] ideals. Oh how the times have changed! It’s not as if the “me, too” Labor Party is covering itself in glory on this issue any more than our beloved government. This is an incomplete post which has been sitting here in draft for a while. Plenty more have written more cogently at length on this topic. So I’ll stop here and leave it to, for example, Sangeetha Pillai. On Saturday night to the SSO’s Tristan und Isolde, conducted by David Robertson. I have always found this a difficult opera to approach. First is to do with the story: there are a few such works, such as King Lear and Otello (the play more than the opera), which you know from the start are not going to end up well, which I have to drag myself to with an anticipatory heavy heart. Tristan is one of those. But I do have a beef with the concept. 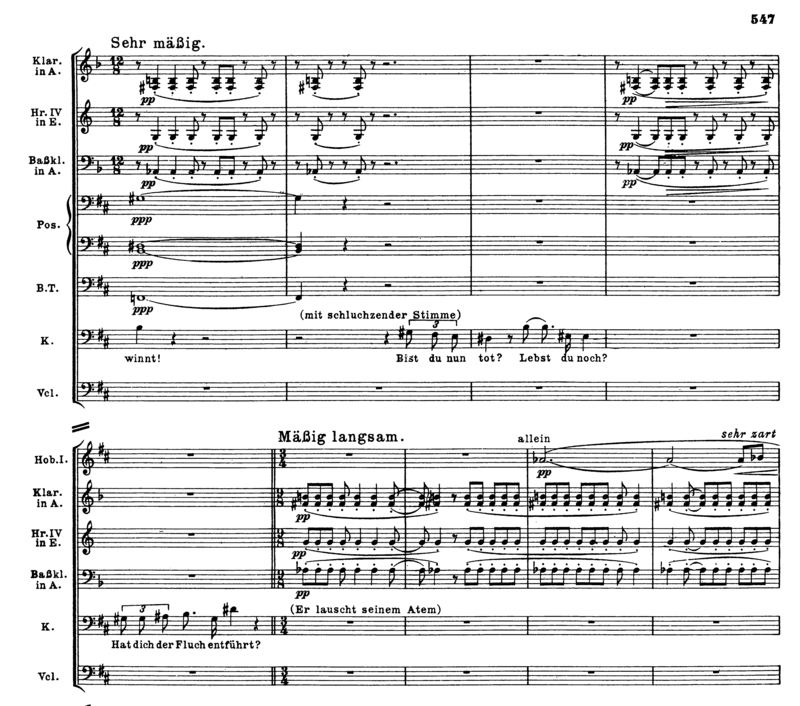 The problem is: what to do about an opera in concert, especially (but not so especially, because large orchestral forces apparently now mandate a concert performance or none at all for Wagner) by a composer who proclaimed the Gesamtkunstwerk? David Robertson has had three goes in Sydney now. 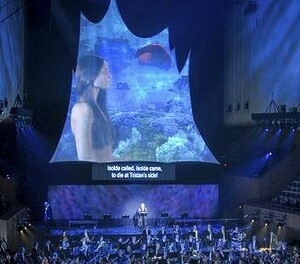 First was The Flying Dutchman, with the digital images projected on a sail behind the stage. Second was Elektra, with some dancers on the stage and a certain degree of dramatization by the singers. This is the third, which has reverted to the projected images on a sail-like screen masking the organ which looks rather as though it has been recycled from the Dutchman. Such images can contribute a lot, and together with lighting and other atmospherics can lift things way above the rather academic sterility of a concert performance with everybody dutifully following the text in their programs. In the first act I was distracted somewhat by the whirring of the fans of the computer operating them, mere centimetres from my ears in the seat behind. This cast a bit of a shadow over my experience of the first act. I just couldn’t hear soft pizzicato bass sounds and the opening of the prelude was masked by the local white noise. Fortunately, I was able to move away. That’s a beef with management for selling me the ticket without warning and pretty personal to me and them. Now I’ve got it off my chest we can move on. My real beef was the use of models to depict Tristan and Isolde. You can get an idea from the picture at the head of this post, pinched from Peter McCallum’s review in the SMH. The picture captures the moment when, dejectedly, the dead Tristan/Lance Ryan left the stage (which is why the image of Tristan is obscured). I found them almost jejune – like the use of similar models rather than singers in Opera Australia’s posters in recent years – and also quite distracting. I had to look away. Perhaps some of my discomfort was because I’m not really accepting the dramatic premiss as I mentioned at the start. Arguably there should be a focus on Tristan and Isolde since the whole point of the drama is that they are focused so very much on each other. Part of the problem for me was that their beauty seemed (inevitably; it always is) too much of the here and now. From time to time when there was a reference to greetings from Isolde, she would say something that looked very much like “Hi.” OK, it could have been “Heil dir, Sonne” (OK, wrong Wagner) but it didn’t look like it. The style, for me, didn’t fit. These images also detracted from the work of the singers, once again placed by Robertson at the rear of the orchestra. A conductor is necessarily an egotist and it may be argued that the orchestra is the true hero of Tristan [and Isolde], but to reduce the singers to tiny figures beneath superhuman projections really rubbed that in. If the problem of a concert performance is that the singers can no longer act, a solution which seems to deny almost any possibility of singerly acting is to me the wrong way to go. Owing to an injury to my knee, I’m less mobile than usual just now. D has been driving me in to concerts in the city. If you book in advance on the internet it is $4.50 cheaper, by the way. The car park was full of families with strollers going to Vivid, and though I was early, I had to go right to the bottom (it really is a “Tiefgarage”) and up again a bit before I found a spot. As I came out of the lift from the car park I met an orchestra member with whom I have a speaking acquaintance – struck up only recently at a piano recital when he recognised me from our days outside concert halls as members of the smokers’ club. That he struck up a conversation at the recital I put down to my being on crutches: this is a bit like having a dog or possibly (I wouldn’t know) a child when it comes to provoking conversation. “You might want to leave at interval,” he said. It wasn’t clear at first whether that was intended as a reflection of his taste or what he thought mine might be – maybe a bit of both. As to the order of the halves, I agree with him. I would have rather left the concert with the exaltation of the symphonic finale resonating within me than the popularism of the Smetana, well-played though that undoubtedly was. On the other hand I liked the Mackey more than my orchestral acquaintance seemed to. To be fair, he did make the point to me that it was a piece with a program. With that program in mind (Mackey’s mother’s “good death” – lucky her) I found it quite rewarding. There were some muted strings towards the end for which I am always a sucker. Maybe I am becoming more receptive to such stuff than I once was, on account of my present infirmity, my age and the age of my parents’ generation. Anthony Marwood was the violinist. David Robertson conducted. Robertson is in town for a sustained period. I expect that’s been lined up to allow time to prepare Tristan und Isolde, scheduled for 20 and 22 June. Vivid now over and its crowds dispersed, and D out of the country, I got myself to the courtesy bus which waits at one end of Circular Quay station to transport less mobile attendees to the Opera House now that no public buses run there. It is a good service though the steps up to the bus must be a bit tricky for some of the clientele. We parted at the SOH as they were off to the preconcert talk in the northern foyer. This was too many steps for me. I had a snack at the Bistro Mozart to accompany some non-steroidal anti-inflammatories. My Australia-Ensemble-going companion, P, complains that not enough Haydn is done these days. In context, I suppose she has Haydn’s string quartets most in mind (nobody grieves very much over the neglect of his baryton trios), but on the strength of the SSO’s performance on this occasion I’m inclined to the same view about the symphonies. The problem is that Haydn wrote so many symphonies: even if the SSO did two a year it would take more than 50 years to get through the lot. That is a bit of a straw-mannish way of putting things. It is not necessary to play every symphony, but there is a lot of good stuff there. It just makes you realise how much recordings and radio have crowded the repertoire. There is these days so much (well-known) music which, from simple numbers of other contenders rather than any particular esoteric or extravagant musical forces, we can only rarely hear live. The Berlioz is another example of a work very well known in recordings and often broadcast, but not so often heard live here. The issue here is probably that big-Berlioz crowds out little or medium Berlioz. It was great to hear it. I would like to hear from the SSO more non-Symph-Fant Berlioz, and not just overtures. What about The Death of Cleopatra? Having mugged up on the text furiously before the concert began, I glanced from time at it in the program booklet. I feel it is a waste of a live performance to keep your head buried in the text to slavishly follow it. Afterwards, my neighbour, a European student visiting Australia, asked me surprisedly “Could you follow the words?” I gathered she didn’t have a very high opinion of Katarina Karnéus’s French. I’m not sure or even convinced KK’s French was totally Gallic, but she projected the gist (which was all that I was after and which I told my neighbour was all I could or sought to follow anyway) very well and over a very wide vocal range – it seemed at one point to go right down to an E below the stave. The Schubert 4 was another rarity on the Sydney concert stage. Predictably, I enjoyed the second movement the most. Predictably because it is a slow movement (could there also have been some muted strings?) and also because my subsequent research reveals that it is most people’s favourite. That’s all very well for him to say. Ph must be at least 10 and more like 15 years older than I. We also discussed the upcoming Tristan. Ph said that Co said to him: “Go to see it twice. We’ll never hear it again in Sydney.” So he is going to both performances, as is Co. I hope time is on my side for that one, because I have only booked to go once. You are currently browsing the Stumbling on melons blog archives for June, 2015.